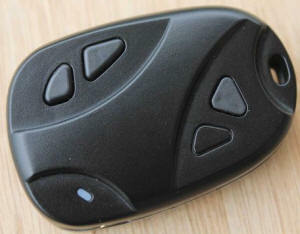 The #26 is one version of the 808 car keys micro camera. Summary of 808 firsts: Video is real 1080p 30FPS H.264 with no missing frames. Uses the SPCA6330A processor. Does not take photos. Cast aluminum case acts as a heat sink. Also takes 720p at 60FPS and 30FPS. Seller reports it will be shipping May 10 2013. Compared to an 808 #3, it is 70% larger by volume, and 150% heavier. Same producer as the #11 and #18. Sold on eBay by beetleonline, spytecinc and others. Video out cable The 808 #26 and the #18 use the same composite video out cable with the non-standard 8 pin connector. The #18 video out cable is available from beetleonline on eBay. Q. Where can I get a driver for the 808 #26? A. There is no driver required for mass storage device mode, but there is a driver for webcam mode. Mass storage device - When the #26 is connected via USB, it installs as a generic mass storage device (a disk drive). Be sure to ONLY use the #26 USB cable that comes with the camera because any other cable might destroy the camera. Webcam - Hold the power and shutter button, and USB connect the camera, then release the buttons. Windows 7-64 will automatically install two DV898 webcam drivers: one for video and one for audio. Webcam works at 720p, 480p and 240p. 130614 808 #26 Firmware. Firmware is in file DV_898.BRN, 4,225,536 bytes, CRC32 is 39A10EAD. The CRC32 is displayed in the zip file. I have not installed or tested it. Michael Kammes modified his 808 #26 with a camera module 15 inch extension cable. 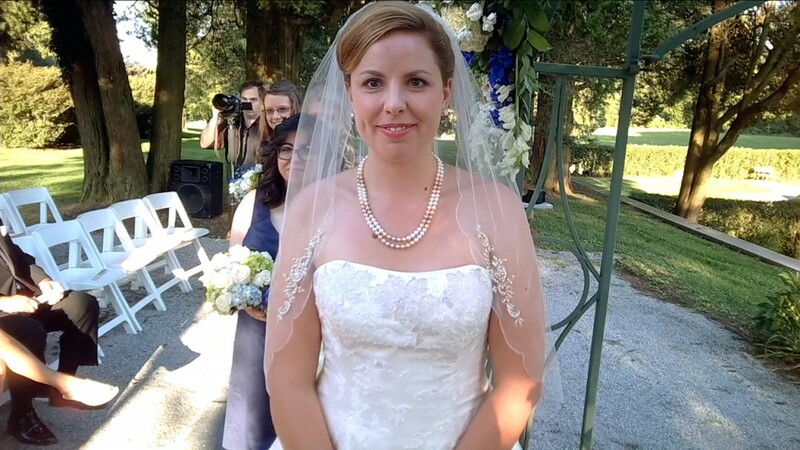 He mounted the camera module on his glasses to record his wedding at 1080p. The #26 body was hidden in his jacket. The research and development used two #26 cameras and two 15 inch extending cables to get it to finally work. 130507 What I received - I have received a box containing an 808 #26 and some accessories. What will you receive? - The listings on Ebay say that the #26 comes with a USB data cable and a card reader. The producer confirmed that this is correct. Dimensions - 808 #26 - Weight 37.93g, Size 19.1 x 35.8 x 59.1 mm. No photos - The #26 takes video with audio. It does not take still photos. USB Cable - The 808 #26 data cable uses the USB-A and UC-E6 connectors. The USB-A is usb.org certified and the UC-E6 is not usb.org certified. 130604 - CAUTION - ONLY USE THE CABLES THAT CAME WITH YOUR #26 CAMERA. LABEL THE CABLES "#26". Every (USB-A to UC-E6) cable is not the same. They are wired many ways. There is no standard (USB-A to UC-E6) cable. Some of those cables might damage the #26 so don't use them. The UC-E6 connector is popular on many digital cameras including Kodak, Nikon and many others. I have a (USB-A to UC-E6) cable, purchased at a $1 store, with (+) and (-) reversed that must not be used with the #26. Empirical wiring of the 808 #26 Data Cable. cable I got from the #26 producer and it works. Video out - With the video cable (sold separately) video-out works while recording. I hooked it up and verified it works. The composite video out (yellow RCA connector) is active while playing an existing AVI file or recording to an AVI file. The mono audio out (red RCA connector) is active only while playing an existing AVI file. The composite video is NTSC 480i-60. PAL is another option. Recording modes are 1080p 30fps, 720p 60fps and 720p 30fps. The battery or the USB A connector can be used to power the camera. With the video cable connected, long press the power button to start composite video. Long press the power button to stop composite video. Is powered from the battery or the USB A connector. Pressing the mode button cycles through the 4 modes: view video files, record 1080p 30fps, record 720p 60fps, record 720p 30fps. 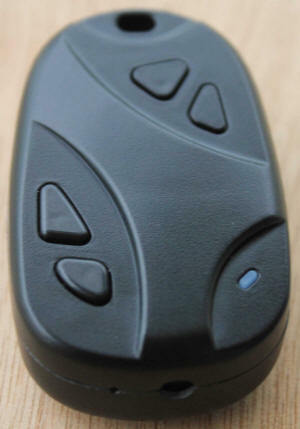 The shutter button is used to select a video file to view, or stop and start recording. WEBCAM - Webcam video works at 640x480 and audio also works. Video and audio works with Skype. First 808 camera to have working audio on the webcam. To enter webcam mode, disconnect the USB, hold the power and shutter buttons down and connect the USB. Continue to hold the buttons until the webcam installs. Installs as three devices. DV898 Imaging Devices, DV898 sound device and USB device. All devices have hardware ID 04FC 6330. AOV - The angle of view measured empirically, using this method. At 36", a landscape 11"x8.5" sheet of paper is about 502 pixels wide, in both 1080p and 720p. This probably means that 720p uses the cropped center of the image sensor. * - 61 degrees is equivalent to a 31mm lens on a 35mm film camera. ** - 43 degrees is equivalent to a 46mm lens on a 35mm film camera. 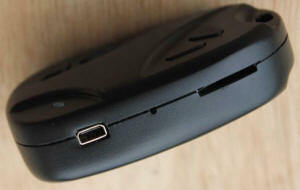 USB Heat - When plugged into the USB the camera gets very warm in the center of the camera case top, the button side. Just below that center is the camera processor using the aluminum case as a heat sink. The camera bottom half also gets warm and that is where the LiPo battery is. I measured using a digital oral thermometer and it overshot 107.9 degrees F. I don't have an accurate thermometer to measure above that. The camera top center gets too warm to comfortably hold in the hand. I have disassembled the #26 and done some measurements. The case assembly is a top and bottom half connected with three screws. The case is metal, not plastic like other 808s. Unpainted on the inside, painted black on the outside. The metal is electrically conductive, probably aluminum. Very precise sub-millimeter accuracy in the casting. Why metal? Thermal conductivity is one reason. The case top half has a 12x12 mm area with thermal compound in contact with the processor. The bottom case has a tab with thermal compound that contacts the back of the internal camera module. NOTE - If modding this camera by removing the case, then a heat sink is required on the processor and maybe on the internal camera module. Case - 19.76g. Two halves and three screws. Maybe cast aluminum. Electrically conductive. Battery module - 10.28g. 5.1 x 29.4 x 36.4 mm without cable and connector. Assembly of LiPo, protection circuit, cable and connector. The battery module is not marked for size or voltage. Foam sticky tape is 1mm thick between the battery module and case. Circuit board with camera module - 7.89g. 25L640 Chip - is an 8-pin, 8 MB (64 Mb) serial flash memory chip that probably holds the firmware. Probably is loaded into RAM when the camera is powered on. 808 #26 inside case botom. 808 #26 inside case top. The 12x12 mm square is thermal compound between the processor and the case. 808 #26 inside button top side. The white paste is thermal compound between the processor and the aluminum case. 808 #26 inside battery bottom side. The 1/4-20 blue (will be black) adapter is a prototype and will be sold separately. The back of the #26 has three assembly holes. Each hole has a recessed Philips screw. Each hole is also threaded for a machine screw. The blue adapter has a brass 1/4-20 (standard photo thread) and the adapter can be assembled onto the back of the #26 with three supplied machine screws. Assembly hole recessed Philips-head screw. Assembly hole machine screw threads. Data cable. Cable has UC-E6 8-pin plug and USB A plug. Has two power wires (GND and +5) and two data wires (D+ and D-). It also charges the battery. The video cable is sold separately. Video cable. Cable has UC-E6 8-pin plug on one end and one end has a USB A that supplies power, not data, to the camera. RCA mono audio (red). RCA composite video (yellow). Three jackets. The power cable is sold separately. Power cable. Cable has UC-E6 8-pin plug and USB A plug. Has 2 power wires (GND and +5). Two jackets. 808 #26 Instruction manual that came with my camera. 130604 - Reports are that setout does not work with Win XP, only Win 7 or newer. 130516 - The setout application and instructions are here. The setout application is used to configure the 808 #26. 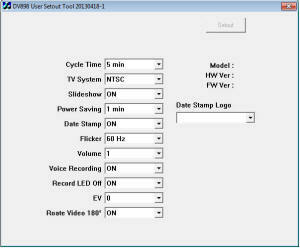 The application displays DV898 User Setout Tool 20130418-1. These eBay sellers are taking orders. Ships from Hong Kong. Some claims from the seller. Support up to 32G TF memory card. Built-in rechargeable high volume Lithium-ion Battery 500mA, it can record about one hour when full charged. Real time record any video evidence instantaneously. 130424 #26 Image By Mtz. SunPlus in Taiwan is the parent company of SunPlus and iCatch. The 808 #3 uses a Sunplus SPCA1527A processor. 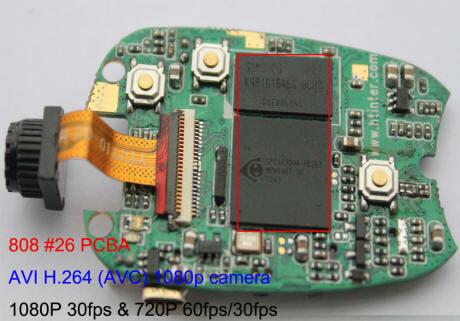 Image sensor is OmniVision OV2710. It is about 7.5 x 5.9 mm. The image area is about 5.9 x 3.3 mm. Here is the iCatch SPCA6330A product brief. Not a full datasheet. 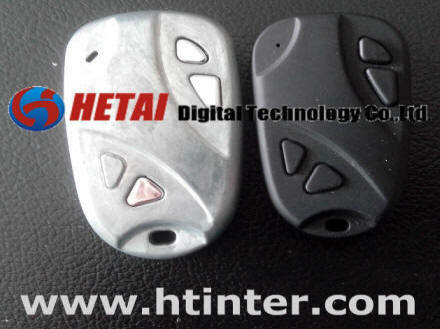 The 808 #26 is the first AVI H.264 (AVC) 1080p camera. QUALITY - In the video samples I have seen, the quality is very good, with correct color saturation and exposure. However, there is some vignetting and the center 80% seems sharp but the periphery seems blurry. RAW SAMPLES - Here are 4 sample videos (8 to 16 MB, 10 seconds each) shortened using VirtualDub, not re-encoded. They show 1080p, 720p, outdoor, indoor, 30FPS and 60FPS. Go to the vault and the C26 folder. MP4 - Avidemux 2.6 (free) will convert the (AVI, H.264, PCM) file to (MP4, H.264, AAC) with no loss of video quality. Converts at about 40 MBps, YMMV. Avidemux - video: copy, audio: AAC, output format: MP4 Muxer. LARGER, HEAVIER - The plastic case is about 10% larger in all three directions and is heavier than other 808 cameras. Dimensions are 58x36x17mm. Complete camera weight is about 46g. Battery is 500 mAh, about 2X other 720p cameras. One button that use to be fake is now real, for a total of 3 real buttons. AUDIO - is PCM at 705.6 Kbps, 44100, 16 bit. At 1080p 30FPS the AVC data rate is about 12000 Kbps. The avi data rate is about 1.5 MBps, about 89 minutes on 8GB. At 720p 60FPS the AVC data rate is about 8023 Kbps. The avi data rate is about 1.05 MBps, about 127 minutes on 8GB. At 720p 30FPS the AVC data rate is about 6051 Kbps. The avi data rate is about 0.8 MBps, about 167 minutes on 8GB. Verified the video plays in Windows Media Player, KMplayer, VLC, VirtualDub. Verified the video imports into editors and converters Windows Live Movie Maker, Sony Movie Studio Platinum 12, Vegas Movie Studio Platinum 9, Avidemux 2.6 imports and converts (without re-encoding AVC) to compatible mp4 AVC ACC. Verified the video does not import into video editors and converters TMPGEnc 4.0 XPress. Avidemux 2.5 will import the video but will not convert it to playable mp4.